The Imaging system will allow you to view documents that have been scanned and filed by various departments. Student Credit and Accounts Payable should be available to most people. Other departments are available only on a per request basis. Click on the BC3IMAGING icon on your desktop or Open your Browser and Select the BC3Imaging link in your Favorites. The Login screen will show. Enter your username and password (username and password is not case sensitive). Click the LOGON button. 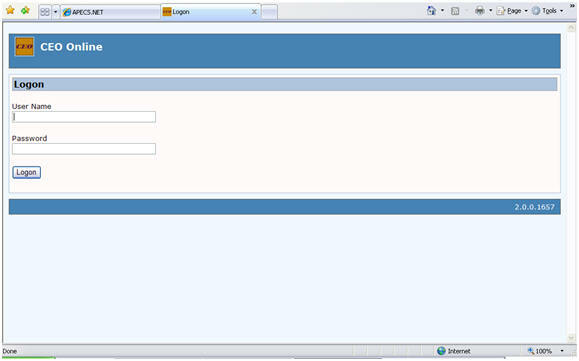 Once you Log into the system the default search screen will show. 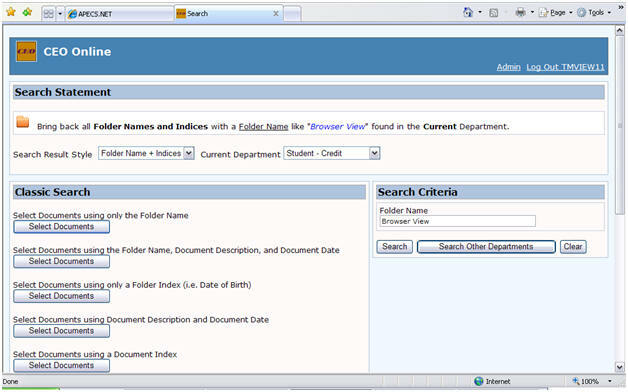 You can switch between the Departments you have access to by selecting them from the Current Department Drop Down. For this example, I am using the Student Credit department. 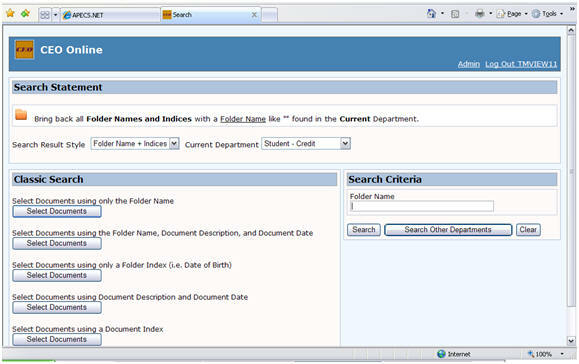 Under the SEARCH CRITERIA heading, enter the Folder Name (For Students enter Last_Name First_Name with no comma. Ex: Artzberger Sara). 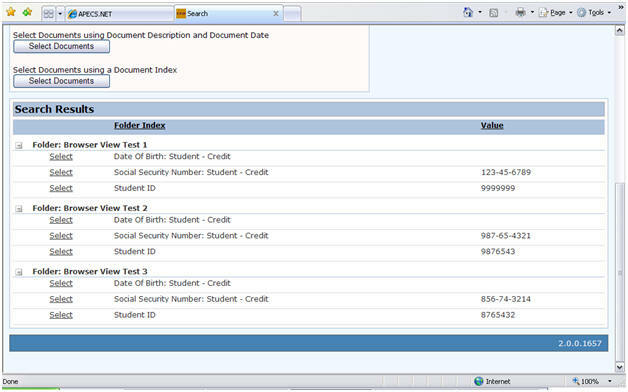 You can enter a partial name and the system will display all folders in the department that start with the partial name you entered. Select the correct folder by clicking on one of the SELECT links under the Folder Name. 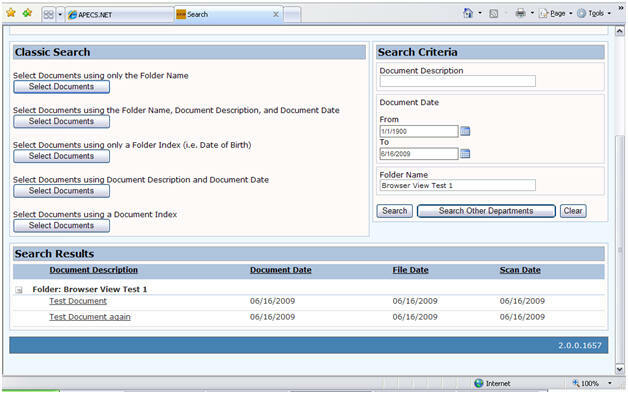 The system will then show you all the documents that are associated with that folder. Click on the Document Description in order to view the document. 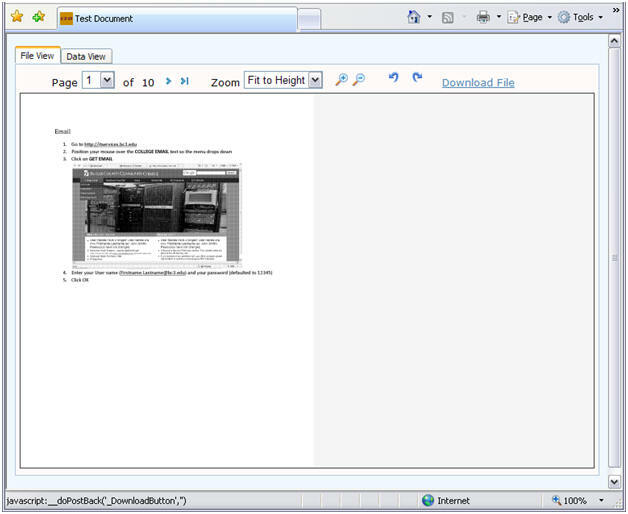 The document will show in a pop-up window. If a new window does not pop-up, make sure you allow pop-ups for the site or hold the CTRL key down while clicking the Document Description. You can jump to a specific page or browse through pages in the document, zoom in on the document, Rotate the document counter clockwise or clockwise, and download the document to your PC (if you have permission). Close the document by clicking on the red X in the upper right corner of the screen. Click on another Document Description to view another document or search for another folder by entering a different name in the FOLDER NAME box under the SEARCH CRITERIA heading and clicking SEARCH or hitting the ENTER key on your keyboard.